People love the furry coat of Huskies! After all, it’s one of the many things everyone loves them. But of course, to keep your Husky’s coat huggable, you should maintain it properly. You’ll need the best dog brush for Husky to do that! There are specialized ones to ensure your Husky’s long coat will properly be groomed and tangle-free. So if you want the Best brush for Husky, I’ll be showing you my three best recommendations! 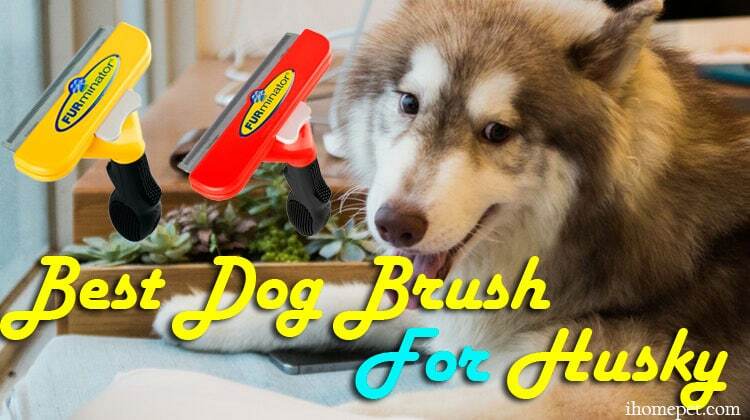 Ensure that the brush you get for your Husky is suitable for long coats. 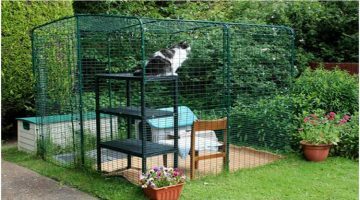 This will ensure that the blades can easily reach into deep parts of his topcoat, removing shedding fur and mats. The brushes should be made of stainless steel, or something equal to that which provides the excellent grooming. The brushes should be able to successfully remove mats in a few glides without exerting too much effort, which hurts your Husky! I recommend you to get brushes with ergonomic handles, which are comfortable for you as you groom. It should also have a self-cleaning feature, making it easier to remove loose fur that caught on the blades. I recommend that you bathe and dry your dog before you brush them, which should be done once a week. Brush them once every three days as well, to stimulate the natural oils to keep your Husky’s coat shiny and healthy. Only apply gentle pressure and avoid putting too much force, especially when detangling fur. Avoid overdoing it, as it may feel uncomfortable for your dog. To keep your Husky’s coat shiny and skin healthy, continue feeding him food high in Omega fats as well. I can say that this is one of the best brushes for a Husky because of how strong it is. It can easily remove all the lose and shedding for from my dog’s thick coat without hurting him. My Husky feels comfortable and relaxed whenever I groom him with this. 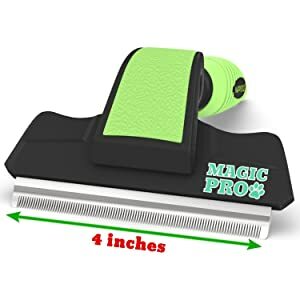 It makes brushing so much easier! The high-quality stainless steel shedding blades are pet-friendly and have been proven to not only remove shedding fur but keep your dog’s coat healthy and shiny. It’s also very easy to clean with its detachable shedding blades. The whole thing is strong and everything I need in one brush, making it well worth the price. 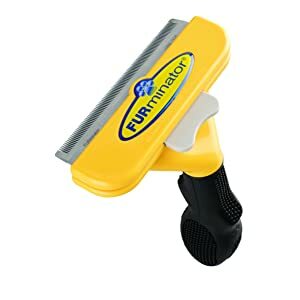 The FURminator comes in various sizes, fit for any breed. I chose the Large size for my Husky, which has proven to be very useful. The blades are made of stainless steel, with the deshedding edge that reaches deeply into my dog’s coat, removing loose hair efficiently. I also love how it comes with an ejector button, which cleans and removes the loose hair from the brush without the hassle. Another thing I appreciate is its handle which is comfortable to use. So just like how comfortable my Husky is while I brush him, the handle is comfortable to hold as well. All in all, a great brush that’s easy to use from the moment you begin grooming down to cleaning! 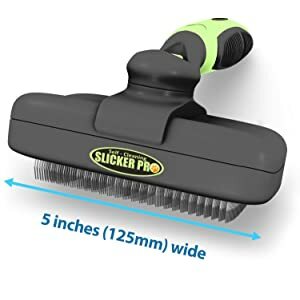 If you prefer a wider and broader brush that covers more area, then I recommend this brush for your Husky. 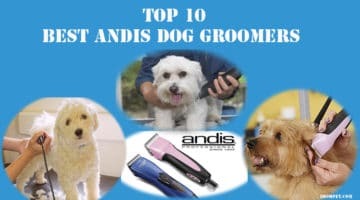 It is perfect for either short or long haired Huskies, which helps efficiently remove all the tangles, mats, and loose fur without having to create too much effort. I noticed that it only takes a few glides and I don’t have to tug or force. My Husky doesn’t yelp while I brush him anymore, and I’m enjoying the process as well since the brush is comfortable to hold! Plus, it has a self-cleaning feature, with just a push of a button. Coming with a warranty and an ebook on dog grooming, I believe it’s worth the investment. I hope that I helped you found the best for brush for Husky! Now you have a helpful tool that you and your Husky will enjoy. No more matting or messy coat anymore. Just make sure you groom them correctly, and you won’t have to worry about a ton of fur shedding around the home anymore. Have fun with grooming! Did you find the article informative? If you would like to ask any questions or share reviews on your brush for Husky, then comment down below. All your comments and feedback will be much appreciated.